So today I learned the State Department issues both Travel Warnings and Travel Alerts. Alerts are for short-term events, Warnings are for risks rising from longer-lasting situations. Just for fun, I browsed their site but couldn’t find any warnings or alerts for the Sinai Peninsula at the moment, even though ISIS and other Islamic groups have been launching a series of attacks there lately, against both tourists and the Egyptian military. 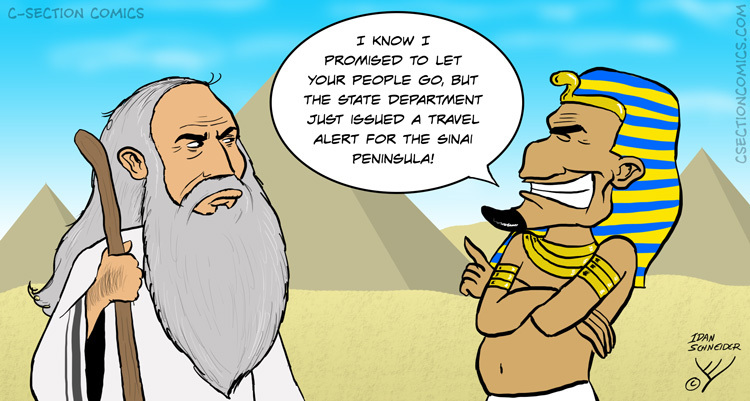 Here are some previous cartoons about Moses, Pharaoh, and the story of Passover. Presidential Candidates – Which Seinfeld Character Are You?